Experience driving an electric bike through one of Europe´s largest urban parks with an expert guide.You will discover trenches built during the Civil War and other constructions such as the beautiful Serpents Bridge. 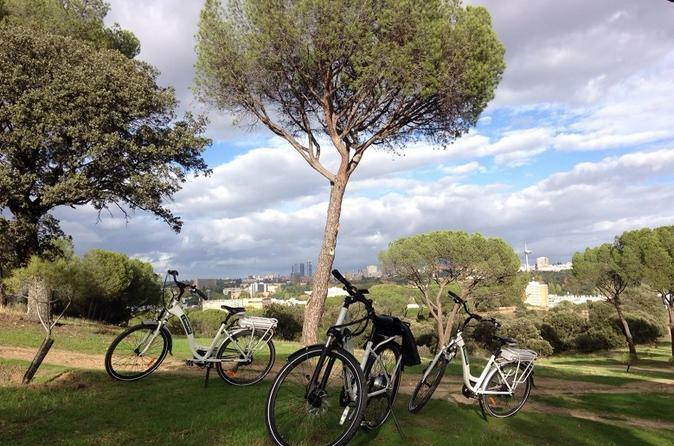 Enjoy the greenest tour in Madrid. Hop on to your electric bike and enjoy a ride that will take you to the newest part of the city. Once the innermost ring road of Madrid, the busiest road in Spain and famous for its traffic jams, it’s now a beautiful pedestrian promenade. After crossing the Bridge of the King, once used by the king to get from the palace to his private hunting ground Casa de Campo, enjoy an hour's ride seeing what the river has to offer. It holds 13 ornamental fountains, five viewpoints to admire the city and even an urban beach! Follow our expert guide to the Casa de Campo, once a forest reserved for kings and noblemen, who would enjoy hunting on its premises,and now a very popular place amongst locals. The small lake which you will see during the tour fills with madrileños during the weekends, rowing boats, and having barbecues. With the assistance of the e-bike’s engine climb a hill where you can take a few minutes to rest and admire the skyline of the city. Then begin the descent towards the river and get a great view of the Cathedral and the Royal Palace from the Huerta de la Partida before returning to the town center.